While it is important for dental providers to keep current with published antibiotic guidelines (which may represent standards of care), there remains some controversy as to the evidence base for the efficacy of these recommendations. When antibiotics are indicated, their appropriate prescription remains an important challenge for dental and medical professionals alike. Given the widespread use of antibiotics, national committees representing authoritative professional groups have made official recommendations pertaining specifically to the indications described above. While the first line of treatment remains rigorous oral hygiene and local debridement as a strategy to decrease oral bacteremia, these organization guidelines help to minimize the negative effects of overprescribing antibiotics, including the development of resistant strains, medicolegal problems for clinicians, allergic reactions to antibiotics, and cost to the health care system.3-5 Understanding the pathogenesis of these infections (including the host immune response to bacteremia), together with the completion of prospective clinical trials, will allow for more evidence-based decisions concerning the continuation of this practice for different patient groups. This article will focus specifically on the quantities and duration of basic antibiotic prescription. A clinical case report is included to help dentists recognize and manage patients who may be candidates for antibiotic therapy. When considering the three major uses of antimicrobial agents in the practice of dentistry, it is paramount that dentists understand the most commonly associated pathogens. Clinical effectiveness in treating an infection is based on correctly diagnosing the infecting micro-organism(s) and choosing the most specific and effective antibiotic. Ideally, bacteriologic assessment should be completed before treatment is started. However, certain conditions may prevent this from happening. For example, treatment for an acutely ill patient cannot be delayed for the 48 hours or more that may be required to learn the results of bacteriologic tests. In such a situation, the choice of antibiotic must be based initially on the dentist’s knowledge of the usual causative micro-organisms in a specific disease entity and the antibiotic to which these organisms normally are susceptible. Table 1 outlines the predominant cultivable flora found in various sites of the oral cavity. Antibiotics are broadly categorized according to their spectrum of activity (see Table 3). Narrow-spectrum antibiotics are effective against either Gram-positive or Gram-negative micro-organisms but generally are not effective against both. Extended-spectrum agents affect a variety of Gram-positive and Gram-negative bacteria, while broad-spectrum antibiotics inhibit both Gram-positive and Gram-negative bacteria and, frequently, other bacteria as well. Although the susceptibility of a given pathogen may fall within the spectrum of activity for any of several antibiotics, it generally is best to use the most specific narrow-spectrum antibiotic to which the micro-organism is susceptible. Narrow-spectrum antibiotics frequently are more effective than broad-spectrum agents against specific groups of susceptible micro-organisms. In addition, narrow-spectrum antibiotics produce less alteration of the normal microflora (that is, collateral damage), thereby reducing the incidence of super-infection. It is from these data that the guidelines described above were designed to help dentists select the appropriate antibiotic for treatment (see Table 4). Antibiotic timing is defined in terms of when to begin or discontinue an antibiotic; this timing is an important consideration for dental practitioners. Again, consonance exists among published guidelines concerning prophylaxis, indicating that antibiotics should be initiated 30–60 minutes before the start of a dental procedure for patients at risk for IE.6-8 A 1990 study by Berney and Francioli was one of the first to scientifically evaluate the efficacy of single-dose amoxicillin either 30 minutes before or 30–240 minutes after bacterial challenge in rats with catheter-induced aortic vegetations.24 The authors verified that while empiric preoperative antibiotics should be considered the gold standard for IE prophylaxis, the antibiotic was still effective, even when it was administered as late as two hours postoperatively. When treating an acute dental infection, antibiotics should be started as soon as possible after the performance of any mechanical intervention (such as incision and drainage). Given the guidelines described above, antibiotic selection can be made empirically based on the suspected pathogen(s); however, samples (such as blood, tissue, or sputum) should be obtained prior to starting the antibiotic to confirm a diagnosis via culture and sensitivity testing. This bacteriologic assessment can take up to 48 hours and ideally should be completed before treatment is started; however, treatment for an acutely ill patient cannot be delayed while awaiting the results of bacteriologic tests. If an appropriate antibiotic was chosen empirically, the patient typically will have defervesced within 48 hours and the culture and sensitivity data will confirm only that an acceptable antibiotic was chosen. If an extended-spectrum or broad-spectrum agent was the initial empirical choice, the dentist may decide to continue therapy or to change to a narrow-spectrum agent. If the patient’s condition has shown no improvement within 48 hours, the results of the bacteriological tests should help guide the prescriber to an alternative therapy. Recent studies have examined circulating biomarkers as surrogates for infections, since the limitations of clinical signs for diagnosing infection are well-known and non-definitive (for example, fever, increased heart rate, and leukocytosis).26 Calorimetry, the multiplex polymerase chain reactions of blood specimens, and biomarkers (especially procalcitonin) can significantly improve the diagnosis of bloodstream infections—possibly before clinical or classical laboratory manifestations—and thus can help dentists to better determine when to start or stop antimicrobial treatment (Chart 1).26 Until such testing becomes more widespread and economically viable, dentists have the option of counseling patients to either stop their antibiotic prescriptions 48 hours after symptom resolution or to take all of the medicine as prescribed until the course of antibiotics is finished. Doern and Brown reported that drug exposure can fluctuate greatly among patients receiving the same antibiotic regimen.39 As a result, dosing regimens based solely on mg/kg values may be inadequate for determining the target drug concentrations that best correlate with bacterial eradication and clinical cure. A more accurate approach for determining appropriate dosing regimens and optimal drug exposure involves integrating the PK/PD parameters of a drug to determine its antimicrobial efficacy. Another important aspect of the integrated PK/PD approach is the ability to more accurately predict whether a dosing regimen is likely to induce bacterial resistance. Typical loading doses usually are twice the antibiotic’s usual dose (for example, 600 mg of clindamycin taken orally immediately, followed by 300 mg taken orally three times per day). This evidence and these guidelines should ensure that dentists select the right drug, in the right dose, at the right time. Ultimately, though, clinicians must determine whether they are treating the right patient. While the individual characteristics described in Chart 2 can help dentists to determine the most effective dose of a medication for a specific patient, other considerations (such as the patient’s pregnancy status, allergy history, ability to manage side effects, socioeconomic status, and level of compliance) all need to be considered. 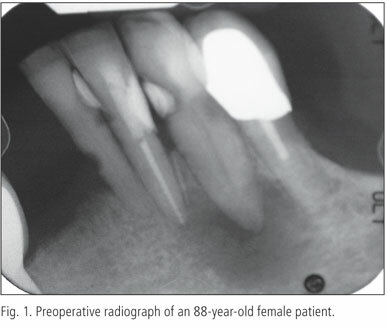 An 88-year-old woman had a chief compliant of “pain and swelling” localized to the left mandibular teeth. Her medical history was significant for depression, hyper-cholesterolemia, and peripheral neuropathy. Her medications included gabapentin (Neurontin, Pfizer, Inc.), sertraline (Zoloft, Pfizer, Inc.), ezetimibe (Zetia, Merck), propranolol (Inderal, Wyeth Pharmaceuticals), amytriptyline (Elavil), celecoxib (Celebrex, Pfizer Inc.), and hydrocodone/APAP (Lorcet). The patient reported no drug allergies but noted a gastrointestinal intolerance to aspirin. Blood pressure taken before treatment was 137/85 mmHg. The patient’s remaining dentition (teeth No. 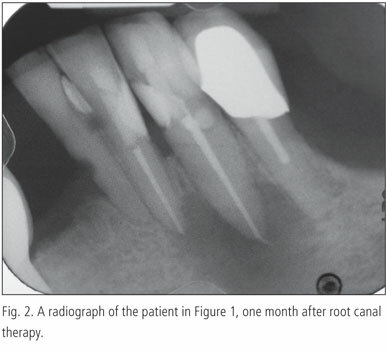 21–24) was examined clinically and radiographically (Fig. 1). Tooth No. 22 was sensitive to percussion and palpation and the radiograph showed a perapical radiolucency. Mild swelling of the buccal vestibule associated with tooth No. 22 was noted. After discussing treatment options and receiving informed consent, root canal therapy was initiated and completed without complication. Postoperatively, the patient was given a prescription of amoxicillin (500 mg, to be taken orally three times a day for seven days). A follow-up conversation with the patient confirmed that she had filled the prescription and completed it as indicated without incident. The patient returned one month later for re-evaluation of tooth No. 22; at that time, she reported mild sensitivity but all other symptoms had resolved following the previous visit. However, six days after the re-evaluation, the patient returned to the office for an emergency appointment, claiming to once again feel extreme pain in the left mandible (Fig. 2). Intraoral swelling of the buccal vestibule adjacent to teeth No. 21–23 was present; in addition, extraoral swelling was present along the patient’s left chin/lower border of the mandible. Clindamycin (300 mg, taken orally) was prescribed immediately; this was to be followed by 150 mg, taken three times a day for 10 days. Three days after starting the clindamycin, the patient returned to the office, complaining of intolerable pain from the area around tooth No. 22. No significant change was noted in symptoms; intra- and extraoral swelling were still present and the patient reported spontaneous and continuous pain. Local anesthesia was administered in preparation for incision and drainage. Profound anesthesia was difficult to achieve due to obvious signs of infection in the area; however, drainage was achieved and the swelling improved almost immediately after copious amounts of pus and blood were expressed. At this time, the antibiotic regimen was switched to 150 mg clindamycin and 500 mg metronidazole, which were to be taken concurrently four times a day. Two days after the incision and drainage, the patient was contacted via telephone and reported that the swelling was reduced and her pain could now be controlled with acetaminophen and ibuprofen. Her only complaints were watery diarrhea and stomach discomfort since increasing the frequency of clindamycin. The antibiotic regimen was changed to penicillin V potassium (500 mg, taken four times a day for 10 days). At a two-week follow-up appointment, the patient reported no pain or discomfort and the affected area appeared to be healing within normal limits. This case report highlights many of the teaching points reviewed in this article. In the case of the patient’s first prescription, empiric therapy with amoxicillin was appropriately prescribed for the suspected pathogens and her symptoms resolved rapidly. The patient also demonstrated excellent compliance with this prescription by taking the medication as prescribed. After incision and drainage, the antibiotic prescription was amended to increase the frequency of the clindamycin with the addition of metronidazole. This combination offers a wider spectrum of activity (Gram-positive, Gram-negative, and anaerobic coverage) compared to clindamycin alone, coupling two antibiotics that work by different mechanisms of action (metronidazole also is bactericidal). The patient reported being much improved within two days but complained of watery diarrhea and stomach discomfort (potential precursor symptoms of antibiotic-induced colitis). Since the patient had begun to defervesce, the clinician made the final antibiotic change (to penicillin alone) and the affected area healed. Overprescription practices for certain medical and dental situations, as well as the development of antibiotic-resistant strains of bacteria, could be greatly abated by paying closer attention to basic principles of prescription writing. A review of the current guidelines and evidence to date shows that all dentists should be able to achieve the goal of antibiotic therapy, to assure selection of the right drug at the right time and at the right dose for the right patient and the right procedure. Dr. Goodchild is a clinical associate professor, Department of Oral Medicine, University of Pennsylvania School of Dental Medicine in Philadelphia, and a clinical assistant professor in the Division of Oral Diagnosis, Department of Diagnostic Sciences, New Jersey Dental School in Newark. Dr. Donaldson is Director of Pharmacy Services, Kalispell Regional Medical Center in Kalispell, Montana; a clinical professor, School of Pharmacy, University of Montana in Missoula; and a clinical assistant professor, School of Dentistry, Oregon Health & Sciences University in Portland. 1. Tong DC, Rothwell BR. Antibiotic prophylaxis in dentistry: A review and practice recommendations. J Am Dent Assoc 2000;131(6):366-374. 2. Coco JW, Pankey JA. The use of antimicrobials in dentistry. Compendium 1989;10(12):664-672. 3. Niederman MS. Can guidelines for the treatment of respiratory infections lead to reduced rates of antibiotic resistance? Semin Respir Infect 2001;16(3):203-209. 4. Gross PA. The potential for clinical guidelines to impact appropriate antimicrobial agent use. Infect Dis Clin North Am 1997;11(4):803-812. 5. Dellit TH, Owens RC, McGowan JE Jr, Gerding DN, Weinstein RA, Burke JP, Huskins WC, Paterson DL, Fishman NO, Carpenter CF, Brennan PJ, Billeter M, Hooton TM; Infectious Diseases Society of America; Society for Healthcare Epidemiology of America. Infectious Diseases Society of America and the Society for Healthcare Epidemiology of America guidelines for developing an institutional program to enhance antimicrobial stewardship. Clin Infect Dis 2007;44(2):159-177. 6. Wilson W, Taubert KA, Gewitz M, Lockhart PB, Baddour LM, Levison M, Bolger A, Cabell CH, Takahashi M, Baltimore RS, Newburger JW, Strom BL, Tani LY, Gerber M, Bonow RO, Pallasch T, Shulman ST, Rowley AH, Burns JC, Ferrieri P, Gardner T, Goff D, Durack DT; American Heart Association Rheumatic Fever, Endocarditis, and Kawasaki Disease Committee; American Heart Association Council on Cardiovascular Disease in the Young; American Heart Association Council on Clinical Cardiology; American Heart Association Council on Cardiovascular Surgery and Anesthesia; Quality of Care and Outcomes Research Interdisciplinary Working Group. Prevention of infective endocarditis: Guidelines from the American Heart Association: A guideline from the American Heart Association Rheumatic Fever, Endocarditis, and Kawasaki Disease Committee, Council on Cardiovascular Disease in the Young, and the Council on Clinical Cardiology, Council on Cardiovascular Surgery and Anesthesia, and the Quality of Care and Outcomes Research Interdisciplinary Working Group. Circulation 2007;116(15):1736-1754. 7. Gould FK, Elliott TS, Foweraker J, Fulford M, Perry JD, Roberts GJ, Sandoe JA, Watkin RW, Working Party of the British Society for Antimicrobial Chemotherapy. Guidelines for the prevention of endocarditis: Report of the Working Party of the British Society for Antimicrobial Chemotherapy. J Antimicrob Chemother 2006;57(6):1035-1042. 8. Roberts GJ, Ramsdale D, Lucas VS, British Cardiac Society Working Group. Dental aspects of endocarditis prophylaxis: New recommendations from a Working Group of the British Cardiac Society Clinical Practice Committee and Royal College of Physicians. Available from: www.rcseng.ac.uk/fds/docs/ie_recs.pdf. Accessed March 10, 2009. 9. American Dental Association; American Academy of Orthopaedic Surgeons. Antibiotic prophylaxis for dental patients with total joint replacements. J Am Dent Assoc 2003;134(7);895-898. 10. Lockhart PB, Loven B, Brennan MT, Fox PC. The evidence base for the efficacy of antibiotic prophylaxis in dental practice. J Am Dent Assoc 2007;138(4);458-474. 11. Lauber C, Lalh SS, Grace M, Smith MH, MacDougall K, West P, Compton S. Antibiotic prophylaxis practices in dentistry: A survey of dentists and physicians. J Can Dent Assoc 2007;73(3):245. 12. Epstein JB, Chong S, Le ND. A survey of antibiotic use in dentistry. J Am Dent Assoc 2000; 131(11):1600-1609. 13. Palmer NA, Pealing R, Ireland RS, Martin MV. A study of prophylactic antibiotic prescribing in National Health Service general dentistry practice in England. Br Dent J 2000;189(1):43-46. 14. Jaunay T, Sambrook P, Goss A. Antibiotic prescribing practices by South Australian general dental practitioners. Aust Dent J 2000;45(3):179-186. 15. Paster BJ, Boches SK, Galvin JL, Ericson RE, Lau CN, Levanos VA, Sahasrabudhe A, Dewhirst FE. Bacterial diversity in human subgingival plaque. J Bacteriol 2001;183(12):3770-3783. 16. Kazor CE, Mitchell PM, Lee AM, Stokes LN, Loesche WJ, Dewhirst FE, Paster BJ. Diversity of bacterial populations on the tongue dorsa of patients with halitosis and healthy patients. J Clin Microbiol 2003;41(2):558-563. 17. Fowler VG Jr, Miro JM, Hoen B, Cabell CH, Abrutyn E, Rubinstein E, Corey GR, Spelman D, Bradley SF, Barsic B, Pappas PA, Anstrom KJ, Wray D, Fortes CQ, Anguera I, Athan E, Jones P, van der Meer JT, Elliott TS, Levine DP, Bayer AS; ICE Investigators. Staphylococcus aureus endocarditis: A consequence of medical progress. J Am Med Assoc 2005;293(24):3012-3021. 18. Tleyjeh IM, Abdel-Latif A, Rahbi H, Scott CG, Bailey KR, Steckelberg JM, Wilson WR, Baddour LM. A systematic review of population-based studies of infective endocarditis. Chest 2007;132(3):1025-1035. 19. Chow AW. Infections of the oral cavity, neck and head. In: Mandell GL, Bennett JE, Dolin R, eds. Principles and practice of infectious diseases, ed. 6. Philadelphia: Churchill Livingstone; 2005:787. 20. Selwitz RH, Ismail AI, Pitts NB. Dental caries. Lancet 2007;369(9555):51-59. 21. Li X, Kolltveit KM, Tronstad L, Olsen I. Systemic diseases caused by oral infection. Clin Microbiol Rev 2000;13(4):547-548. 22. Holmstrup P, Poulsen AH, Andersen L, Skuldbol T, Fiehn NE. Oral infections and systemic diseases. Dent Clin North Am 2003;47(3):575-598. 23. Shaw JH. Causes and control of dental caries. N Engl J Med 1987;317(16):996-1004. 24. Berney P, Francioli P. Successful prophylaxis of experimental streptococcal endocarditis with single-dose amoxicillin administered after bacterial challenge. J Infect Dis 1990;161(2):281-285. 25. Rubinstein E. Short antibiotic treatment courses or how short is short? Int J Antimicrob Agents 2007;30 Suppl 1:S76-S79. 26. Muller B, Schuetz P, Trampuz A. Circulating biomarkers as surrogates for bloodstream infections. Int J Antimicrob Agents 2007;30 Suppl 1:S16-S23. 27. Hedrick TL, Evans HL, Smith RL, McElearney ST, Schulman AS, Chong TW, Pruett TL, Sawyer RG. Can we define the ideal duration of antibiotic therapy? Surg Infect 2006;7(5):419-432. 28. Guillemot D, Carbon C, Balkau B, Geslin P, Lecoeur H, Vauzelle-Kervroedan F, Bouvenot G, Eschwege E. Low dosage and long treatment duration of beta-lactam: Risk factors for carriage of penicillin-resistant Streptococcus pneumoniae. J Am Med Assoc 1998;279(5):365-370. 29. Cleveland JL, Kohn WG. Antimicrobial resistance and dental care: A CDC perspective. Dent Abstr 1998;43:108-109. 30. Walker CB. The acquisition of antibiotic resistance in the periodontal microflora. Periodontol 2000 1996;10:79-88. 31. Roberts MC. Antibiotic toxicity, interactions and resistance development. Periodontol 2000 2002;28:280-297. 32. van Winkelhoff AJ, Herrera Gonzales D, Winkel EG, Dellemijn-Kippuw N, Vandenbroucke-Grauls CM, Sanz M. Antimicrobial resistance in the subgingival microflora in patients with adult periodontitis. A comparison between The Netherlands and Spain. J Clin Periodontol 2000; 27(2):79-86. 33. Golub LM, Ramamurthy NS, McNamara TF, Greenwald RA, Rifkin BR. Tetracyclines inhibit connective tissue breakdown: New therapeutic implications for an old family of drugs. Crit Rev Oral Biol Med 1991;2(3):297-321. 34. Greenstein G. Clinical significance of bacterial resistance to tetracyclines in the treatment of periodontal diseases. J Periodontol 1995;66(11):925-932. 35. Golub LM, Suomalainen K, Sorsa T. Host modulation with tetracyclines and their chemically modified analogues. Curr Opin Dent 1992;2:80-90. 36. Edlund C, Hedberg M, Nord CE. Antimicrobial treatment of periodontal diseases disturbs the human ecology: A review. J Chemother 1996;8(5):331-341. 37. Thomas J, Walker C, Bradshaw M. Long-term use of subantimicrobial dose doxycycline does not lead to changes in antimicrobial susceptibility. J Periodontol 2000;71(9):1472-1483. 38. Preston SL. The importance of appropriate antimicrobial dosing: Pharmacokinetic and pharmacodynamic considerations. Ann Pharmacother 2004;38(9 Suppl):S14-18. 39. Doern GV, Brown SD. Antimicrobial susceptibility among community acquired respiratory tract pathogens in the USA: Data from PROTEKT US 2000-01. J Infect 2004;48(1):56-65. 40. Cunningham FG. Teratology, drugs, and other medications. In: Cunningham FG, Leveno KJ, Bloom SL, Hauth JC, Gilstrap LC and Wenstrom KD, eds. Williams manual of obstetrics: Pregnancy complications, ed. 22. Norwalk, CT: McGraw-Hil;1997:44-70. 41. Korzeniowski OM. Antibacterial agents in pregnancy. Infect Dis Clin North Am 1995;9(3):639-651. 42. Avelox [package insert]. West Haven, CT: Bayer Pharmaceuticals Corporation;2004. 43. Bunz D, Gupta S, Jewesson P. Metronidazole cost containment: A two-stage intervention. Hosp Formul 1990;25(11):1167-1177. 44. Bunz DM, Frighetto L, Gupta S, Jewesson PJ. Simple ways to promote cost containment. DICP 1990;24(5):546.